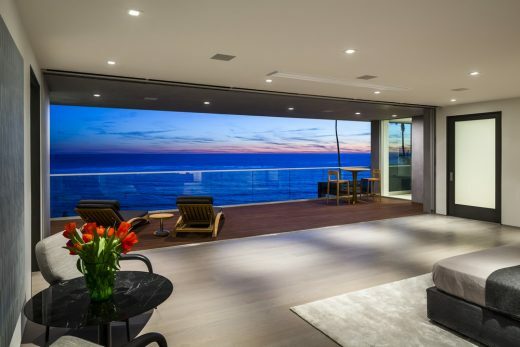 MariSol Modern is the fifth extraordinary estate built by the developers of MariSol Malibu and in partnership with architect Doug Burdge, furniture design firm Minotti, and Cal-Point Builders. At the prestigious 2015 Pacific Coast Builder’s Conference, MariSol Modern took the top prize, winning the Grand Award for Best on the Boards Custom Home over finalists from Aspen, Big Sur, and Santa Fe (Richard Landry). Listed at $27,900,000, the 13,814 sqft (under roof) Doug Burdge exceptionally private estate is situated on one acre of exquisite gardens, on an oceanfront bluff top, 80 feet above and with 137’ of frontage on Malibu’s finest surf break, in MariSol Malibu, Malibu’s exclusive and exceptionally private 80 acre 17-home resort-style community. Highlighting the main home’s living space is an elevator-accessed 2,500+ sqft (decks included) master suite with his and her closets and baths, fully equipped gym and bath, office, coffee and wet bar, safe room, putting green, massage and sun decks, multiple tvs, above-bed in-ceiling theatre screen and to-die-for views of the surf break and islands. Elsewhere in the main house are 5 bedrooms (including maid’s), 8 baths, indoor/outdoor fully stocked bar plus keg beer, billiard room, exceptional 150” screen theatre, great room, living coral aquarium, chef’s kitchen with separate prep kitchen, family room, laundry and 3 car garage. The house is fully furnished with Minotti’s finest and highlighted with exciting modern art. Surfaces are stone and hardwood from LA’s finest vendors. Appliances and tvs are top of the line. Fleetwood windows pocket, opening to grand patios and gardens. Sleeping spaces and closets are shaded (sunscreen and blackout) by Crestron. The home is state of the art smart and the a/v throughout is exceptional. The impeccably furnished 2-story studio includes a 2-car garage. The grounds are equally extraordinary and include more than 100 rare specimen palms and exotic trees. Beachside is a 67’ zero and infinity edge pool and spa overlooking the surf break, bookended by private lounging and dining bungalows. Adjacent is a 1,500 sqft stone deck furnished with teak chaises, umbrellas and tables. A BBQ center is next to the dining pavilion and an outside shower is located in a specimen palm garden. All this elevates above a 4,000 sqft private sand “beach” framed with palms, lush plantings and lawn. Garaged parking is for 5 – there is parking space on site for 6 more.